If your business has two or more owners, you need a Buy-Sell Agreement. 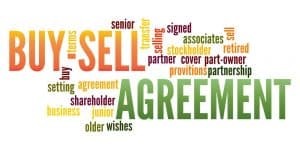 A buy-sell agreement is simply a contract between two or more business owners that formally documents contingency plans if a life changing event occurs. Some people refer to these agreements as “prenups” for business owners. In the agreement, the business owners agree upon what happens to the ownership structure of the company in the event of one owner’s death, divorce, disability, retirement or other life changing events. Many business owners don’t realize until it is too late the importance of a buy-sell agreement. For example, if an owner gets divorced, the business may become hostage to the marital dispute. Or if an owner dies, the surviving business owner(s) may inherit heirs for business partners, who care little about whether the business survives. Without a buy-sell in place, you are opening yourself and your business up for unknown risks. Protect yourself and your business from the unknown future with a buy-sell agreement. Ensuring that critical events are properly covered is essential to the long-term survival of your business. Exit Planning vs. Succession Planning? Often times the terms Succession Planning and Exit Planning are used interchangeably but they should not be. Both Succession Planning and Exit Planning should be addressed as separate plans. Succession Planning is planning for leadership continuity. It identifies and fosters the next generation of leaders within a business. It’s a process because it requires a company to develop internal people with the potential to fill key positions within an organization. With a proper Succession Plan, a business will seamlessly transition leadership. There’s been a lot in the news lately about huge settlements that big companies have made for employment law issues. Whether it be for misclassification of workers or violation of wage and overtime laws, businesses continue to pay large fines for not following employment laws. For example, Uber drivers recently filed a class action lawsuit claiming they have been misclassified as independent contractors and are entitled to be reimbursed by Uber for expenses such as gas and vehicle maintenance. This lawsuit was costly. Uber agreed to pay $100 million to settle independent contractor misclassification claims. Buying and selling real estate. Do I need an attorney? The process of buying and selling real estate can be complex and it often represents one of the most substantial investments made by an individual or a business. Although using an attorney to assist with the process will not be free, the fees are a minor expense in relation to the significance of the transaction, and is certainly money well spent. Handling a real estate transaction without an attorney may complicate the process in the short-term and increase risks and expenses long-term. So, how can an attorney assist you in the buying or selling process? Attorneys are able to negotiate the terms of the real estate purchase agreement to ensure your interests are protected, whether you are buying or selling. Attorneys are able to structure the transaction in a way to minimize present and future tax liability and limit personal liability for matters relating to the real estate. Attorneys are able to prepare agreements between partners in a real estate investment, as well as lease agreements with potential tenants. Attorneys are able to conduct due diligence with respect to the real estate, to help you fully understand what you are buying and identify issues ahead of time. This includes reviewing the title work relevant to the property. Attorneys are able to coordinate with other parties to the transaction, including real estate brokers and title companies, to ensure that the closing happens in a timely and efficient manner. In summary, if you are buying or selling real estate, a real estate attorney will work for you to ensure you get the most out of your investment.